The smallmouth bass fishery on the Broad River between the Parr Reservoir and the city of Columbia is defying the expectations of fisheries biologists and delighting Midlands anglers. On a recent float and fishing trip down the lower Broad River, the sight of an osprey with a fish in its clutches brought a big smile to the faces of everyone in our party. The sight of fellow "fishers" like ospreys successfully fishing is good karma for us human anglers! Armed with both spinning and fly gear, we soon hopped out of the boats near a shallow riffle area to wade and fish. On my second cast to a run easily five feet deep, my spinning line abruptly stopped its downstream tumble in the swift current. Pulling back, I thought I had hung up on the bottom. Movement of the line told me otherwise, and my light rod quickly bent under the weight of a heavy fish. All of a sudden, in a jump that would have put a tarpon to shame, a flashing smallmouth bass launched itself at least five feet in the air, shaking its head and tossing the lure about halfway back to me! Standing frozen in the moment with my mouth wide open, I could only laugh as I began reeling the slack line back in. Midlands rivers are known for plentiful panfish such as redbreast and redear sunfish, and also for largemouth bass, but on this trip, the real draw was the fiesty smallmouth bass that are unexpectedly thriving in this stretch of the Broad River. 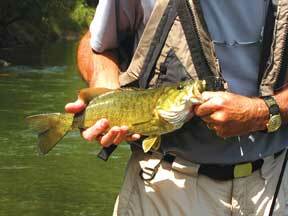 Smallmouth are a premier gamefish, known to respond when hooked with the strength and speed of fish twice their size. That legendary tenacity is what drove us to paddle miles of the Broad that day. Kayaks and canoes were used to get us downriver to the rocky shoal areas that oxygenate the water and serve as food factories for fish. 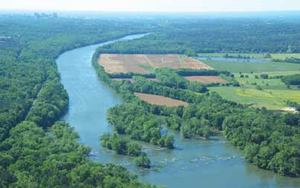 Those same shoals limit motorboat use on this stretch of the Broad, and the twenty-five river miles from Parr Reservoir downstream to the Columbia Diversion Canal are somewhat difficult to reach because of limited access. Only the unimproved boat landing below the S.C. Highway 213 Bridge, a throw-in site at the Palmetto Trail parking area near Peak, and a second throw-in-only site nearly nineteen miles downstream at Harbison State Forest are currently open to the public along what the River Alliance of Columbia calls the "Broad River Blueway" (find them on the Web at https://riveralliance.org/). This restricted access is somewhat of a mixed blessing for anglers. The smallmouth fishery certainly benefits from it, as it does from the productive, rocky habitat, but it also makes getting to the fish a challenge. Luckily for us, on this trip a private landowner's generosity reduced our distance from put-in to take-out to just five miles, allowing for more fishing time. We had good luck for both largemouth and smallmouth bass that day, in addition to the many redbreast and sunfish caught and released. "Rooster tails" and other similar spinning lures in the smaller 1/8-ounce size worked well, as did smaller plastic baits, such as two-three inch "curly tails" or "flukes," all fished with single hooks for quicker releases. Tube baits and spoons with enough weight to be fished near the bottom also produced fish - or at least solid hook-ups like my first strike of the day! Crank baits are effective too, but I generally limit their use to slow days or deep runs, as the treble hooks are so difficult to remove, delaying releases. Smallmouth are so aggressive that live baits are usually not worth the bother, though these often produce in colder months when fish metabolisms and feeding are slower. 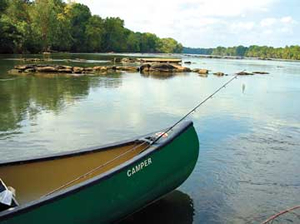 Fly fishing is especially enjoyable in the Broad River, and the same flies that work for largemouth bass and larger trout, such as streamer patterns that imitate the plentiful minnow populations, are also effective for smallmouth. Crayfish patterns and the all-purpose "woolly bugger" are also productive when fished on the bottom where crayfish and larger insects live. Larger surface flies and popping bugs work well also, especially in warmer months. Surprisingly, those top-water offerings can produce strikes even in the bright sunlight that all bass are thought to avoid. The key is to fish near structure of any type, as both the largemouth and smallmouth bass prefer to lie in ambush for their prey. The state of North Carolina first established smallmouth bass in the Broad River drainage, stocking the popular gamefish from 1941 to 1985. In South Carolina, smallmouth bass were first stocked experimentally in the Broad River drainage in York and Cherokee counties. A tributary, King's Creek, was stocked in 1984, and a second stocking was done in the main stem of the river above the Lockhart Hydroelectric facility in 1990. The idea was to increase the diversity of sport fishing in that part of the state. 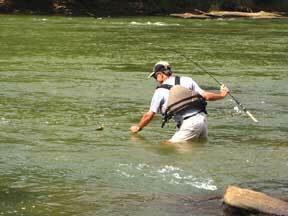 Biologists considered the habitat in King's Creek, with its cooler, cleaner water, a good fit for the smallmouth. The chances for reproduction in the warmer, more silt-laden waters of the Broad's main stem were considered poor, and the fishery was considered controllable through discontinuance of stockings, as the fish were anticipated to remain relatively confined to the Upstate stretches where they were placed. But a 2003 sampling study by the S.C. Department of Natural Resources found something unexpected - substantial numbers of smallmouth bass in the Broad River immediately above Parr Reservoir. The sampled fish showed growth typical of piedmont streams, and evidence of reproduction. Study coordinator and DNR fisheries researcher Jason Bettinger summed up the results like this: "The study found the Broad River to be a predominantly largemouth bass fishery with a small, but unique, smallmouth fishery and a strong following of anglers reporting frequent success." 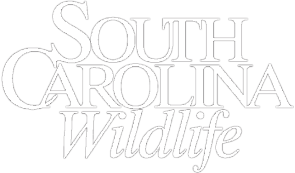 By contrast, the DNR fisheries biologist for the Midlands, Ron Ahle, noted that a similar stocking effort of smallmouth bass in the lower Saluda River, in the cooler waters below Lake Murray in the mid-1980s, "never developed significant populations." But here's where it gets really interesting. 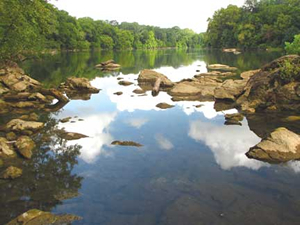 Since the 2003 study, smallmouth bass have also begun showing up below Parr Reservoir, as far downstream as the Congaree River below Columbia, in fact. Catches have been reported well south of Columbia, and a DNR sample in the upper reaches of Lake Marion even produced smallmouth. Both anglers and fisheries biologists have been surprised by this turn of events, as smallmouth typically prefer cooler water temperatures, and those stretches of the Broad and Congaree reach the upper 80s in the summertime. More typical would be the established smallmouth fishery in Lake Jocassee, which has the colder water that these fish usually thrive in, and where the current state record smallmouth was caught in 2001 - a 9 lb. 7 oz. trophy. Fisheries biologist Jim Bulak, who leads the DNR's Freshwater Fisheries Research Section, thinks the reason may be as simple as an abundant food supply. "The smallmouth may be able to live with their higher metabolism due to the plentiful food base" [in the lower Broad and Congaree rivers], says Bulak. "The warmer water temperatures increase the fish's metabolic rate, which requires more food, and the smallmouth have obviously been finding plenty." 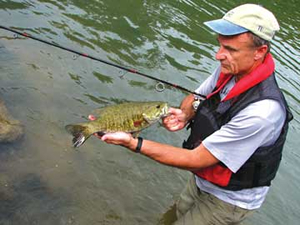 Smallmouth in the four-to-five-pound range have been reported by many Broad River anglers, with one-to-two- pound fish fairly common. Those catches are great proof that there is ample food for the bass to eat. Biologists also theorize that the movement of smallmouth downstream from Parr Reservoir is occurring as small numbers of the fish survive passage through the electric turbines at the reservoir's dam or pass over the spillway during periods of heavy rainfall. The same situation may have occurred at the diversion dam for the Columbia Canal, where a fish ladder constructed in the past decade has enabled fish movement both up and down the Broad. According to DNR regional fisheries biologist Hal Beard, while the smallmouth population below Parr has definitely benefitted from stocking efforts, it may now be self-sustaining. "Since the time it was confirmed that the smallmouth bass had expanded its range below the Parr Dam, several stockings have been conducted to augment naturally occurring reproduction, but the need for additional stocking is under review and will be based on future monitoring of the fishery," says Beard. "Study results suggest that the species is likely capable of maintaining a self-sustaining population in the presence of appropriate harvest regulations." 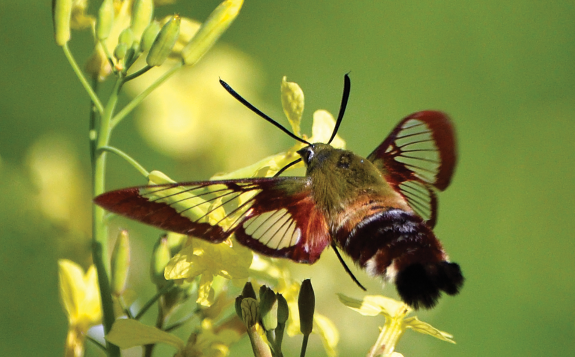 For Midlands area anglers and visitors, the discovery of the hard-fighting species normally found in more northerly climes has been a terrific surprise. While access to the Broad above the diversion dam is limited, access in the confluence area is very good, due to the Three Rivers Greenway, built by the cities of Columbia, West Columbia and Cayce, in conjunction with the River Alliance. The parks and walkways of the greenway have opened up miles of the banks of the Broad and Congaree rivers with paved trails to walk, run and bike, and miles of river for swimming, fishing and paddling. This is somewhat of a mixed blessing though, as improved access will inevitably lead to more fishing pressure. Responding to concerns voiced by anglers that the aggressive behavior of smallmouth could lead to overfishing, DNR Chief of Fisheries Ross Self says the agency is proposing new limits that should address that problem. "The DNR, with input from the public, has proposed regulations to protect the self-sustaining smallmouth population," says Self. 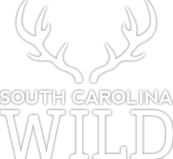 "Instead of the current ten bass daily limit, an aggregate limit of five bass (largemouth, smallmouth and redeye), with a twelve-inch minimum length on smallmouth, is being proposed for legislative approval as part of an overhaul of South Carolina fishing regulations." That may be enough to allow the smallmouth to continue to survive, and further studies by DNR fisheries biologists are already underway to provide for protection of the fishery using science-based management. "The Broad River study that was begun in 2009 will help provide evidence about whether stocking of the fish should be continued or if further regulation changes are needed," says Ahle. 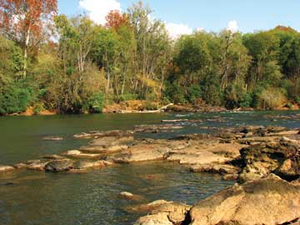 The study, which utilizes techniques such as electro-shocking for fish population samples, will look at issues like fishing pressure, fish passage at the Columbia Diversion Dam, and industrial and residential development and impacts to the Broad River watershed as a whole. In the interim, hopefully anglers will realize what a wonderful and unique fishery has established itself in the Broad and will voluntarily limit their take to five bass a day or fewer. All fishermen like the tug on the end of the line, especially when it's from a smallmouth that was safely returned by sporting anglers to grow even larger! 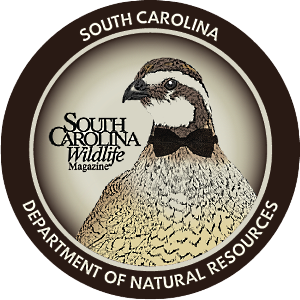 Longtime SCW contributor Malcolm Leaphart is the founding president of the Saluda River Chapter of Trout Unlimited in Columbia, and speaks and writes frequently about water quality issues and South Carolina's freshwater fisheries.